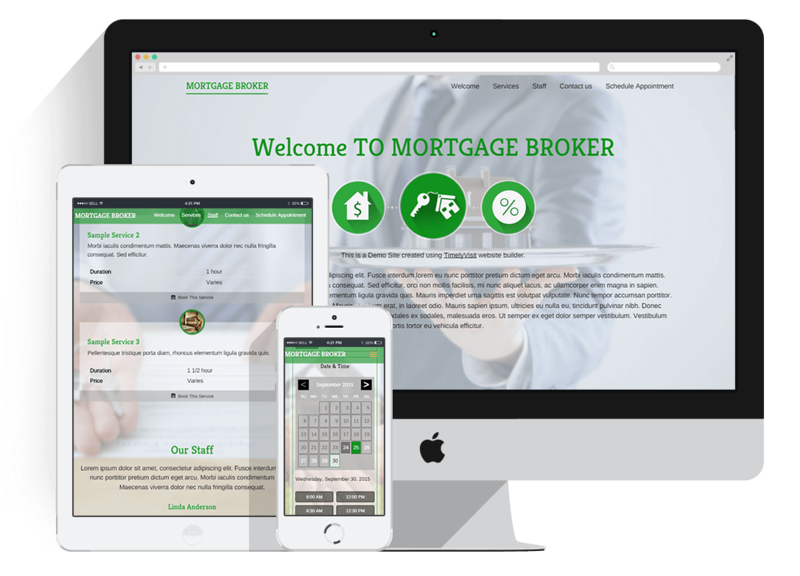 Choose themes specifically designed for mortgage brokers. Whether you are a one person shop or have a full staff, your site will be professional and express the personality of your business. Mortgage brokers are seeing a rise in potential clients as individuals take advantage of the housing market and many have begun to look into purchasing their first house. While this is great for the mortgage business, it can create quite a hectic day that consists of meetings and phone calls. Make this one step easier with your own professional website. Our customizable websites allow you to get the professional look you want your mortgage customers to see, offer an easy setup, and allow you to offer online scheduling for appointments. Set up your schedule and let clients know when you are available, then they can choose an appointment time that works for both you and them with convenient online scheduling.